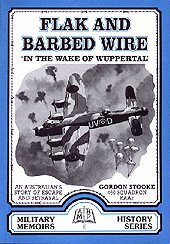 World War II Story of a Lancaster Bomber, Flak and Barbed Wire by Gordon Stooke. Be my guest. Read the true story about an Australian Lancaster bomber, during a World War II mission over Germany, being coned by searchlights at 20 000 feet , hit by flak, then the crew bailing out over Belgium. This is an extract from Chapter 2 of "Flak and Barbed Wire" by Gordon Stooke. This book also describes life in RAF Bomber Command, bombing raids, evasion attempts, capture, interrogation by the Gestapo, prisoner of war life in Germany and eventual release by the Russian army. Gordon Stooke was a pilot of a Lancaster Bomber on 460-Squadron RAAF. Pay by Draft, cheque, Visa, Mastercard or Bankcard. If you have any comments you can email the author's son. From Chapter 2 of "FLACK & BARBED WIRE." Even though the events in this story took place a long time ago, they are still vivid in my memory. Perhaps the setting down of this one of many experiences may help to exorcise some lingering effects. This story is not unique. Like hundreds of other twenty year olds, I was the pilot and captain of a Lancaster four-engine heavy bomber. The target for the night of the 24th June 1943 was the German city of Wuppertal in the Ruhr valley. Dusk was falling and with propellers lazily ticking over, my bomb laden aircraft was one of 15, queued nose to tail, at RAAF Station Binbrook, Lincolnshire, waiting its turn to take off. 460, Squadron, one of five Australian heavy bomber squadrons in Bomber Command, had already achieved a proud record. Even so, by the end of World War 11, my squadron had flown more sorties (6,264), dropped more bombs (24,856 tons) and received more decorations than any other squadron in the history of the Royal Air Force. During 1943-44, raids by RAF Bomber Command into Europe increased in frequency and intensity. At the same time, so did the effectiveness of the German defences. Luftwaffe night fighters used sophisticated radar locating devices to find attacking bombers in the dark and the aim of electronically predicted anti-aircraft guns and searchlights on the ground, became unerring. Even though German location techniques were countered to some extent by British radar disrupting devices and other measures, the inevitable result was an ever increasing toll on RAF aircrew and aircraft. Losses, sometimes as high as 90 bombers (eg, Berlin), were generally about 30 aircraft or 210 aircrew per raid. Only 10% of those shot down, were reported as becoming Prisoners of War. Aircrew were required to carry out 30 raids to complete one tour of operations before being rested. During a tour 900 aircraft, ie. 30 raids X 30 aircraft per raid, would have been lost. As there were about 750 attacking aircraft in each raid, survival it seems, was arithmetically impossible. For all that, a rare few even finished a second tour of a further 20 operations. It was said that after completing 10 operations, just maybe experience became a plus factor making the following 20 a little less hazardous. Even so over 5000 young Australians died in Bomber Command. How did aircrew maintain morale in the face of such unacceptable odds? Maybe it was because we were all so young and with the optimism of youth, never believed "it" would happen to us. Infallible youth? Overconfidence? Pride? Maybe we just shut our minds to reality when in real and constant danger. Even under the most adverse circumstances, few were willing to dwell on the fact that we could well lose our lives. Anyway over enemy territory we were too preoccupied to consider such things. Later, after the danger had passed, then maybe a nervous witticism or two or possibly fake bravado, revealed unexpressed fears and mute relief. In a sad, paradoxical sort of way, I suppose, with sword in hand, we came to accept our own dire peril and the shock of mates "getting the chop" as part of life in those irrational and dispassionate days. At 2223hrs a green flare from the Duty Pilot and the first Lancaster rolled forward, turned left, then accelerating, disappeared over a crest in Binbrook's peculiar runway, to appear again, thankfully, as it struggled heavily laden into the air. Directly in front of us was G for George, later incredibly surviving 95 operations, then flown to Australia and installed as a permanent exhibit in the War Museum, Canberra. One by one, 460 Squadron became airborne. All the while we waited, with our engineer watching engine temperatures like a hawk. Too high and we would have to shut them down to cool them off. G-George took off and then it was our turn on the runway. First a burst of throttles, then I turned left and lined up with the runway. I put down 10 degrees of flaps, pitch full fine, mixture rich, trim controls centre. Now brakes on. Throttles to 1000 revolutions. A green from the Duty Pilot's Aldis lamp and I released the brakes. D-Donald trundled forward as I opened the throttles, slowly at first, then accelerated. A slight swing to the left was corrected by leading the left two throttles in advance of the right. Control column forward to raise the tail as the slipstream increased. 50mph reached. Direction control established using rudders. Throttles fully forward. Handed them over to the engineer who made sure they were fully home, He tightened the friction nut, locking them. Engines 3000 revolutions per minute (R.P.M. ), boost +14lb/sq.in. Speed 110mph. I eased back on the control column. D-Donald reluctantly heaved itself, 1500gls of fuel, 11,000lbs of bombs and seven human beings into the air. 130mph., undercarriage up. 140mph., flaps up. 160mph., engines down to +9lbs/sq.in. boost, 2850rpm. We checked oil and coolant temperatures. All OK. I trimmed the control surfaces for climb. We were at 500 feet. "What's the course for the rendezvous point, navigator?" "150 degrees magnetic, Skipper. Estimated time of arrival (ETA) at rendezvous point 2251hrs at 10,000ft." On course now, D-Donald dragged itself up, ever higher, engines roaring with the toil of it. Dusk became night as the sun finally disappeared over the western horizon. On reaching the rendezvous point, I asked the navigator for a course to the Dutch coast. "120 degrees magnetic and climb on to 20,000ft, Skipper. ETA Dutch coast 2355hrs," he answered. We had been routed over Grevelingen (waterway) between Rotterdam and Antwerp. This course avoided the anti-aircraft defences concentrated around these two cities. Nevertheless the Luftwaffe night fighter squadrons based in Holland, would certainly be on the lookout for us, so the gunners had to keep their eyes skinned. I checked with them over the intercom. "We were all eyes long ago, Skipper," the rear gunner said. "20,000ft and the Dutch coast five minutes away," the navigator reported. Soon below us was Holland's southern coast. The moon's reflection on the water outlined two large peninsulas jutting out into the North Sea. To the south was Shouwen and Walcheren and to the north, Voorne, "Cruising revs. +4lb/sq.in. boost and try 1800rpm," I told the engineer. Straight and level, D-Donald cruised at 160mph indicated air speed (I.A.S.). "Course change Skipper," the navigator reported. 104 degrees magnetic, distance to Wuppertal 145 miles, ETA 0035hrs. We'll be passing between Duisburg and Dusseldorf just before the target so it'll get pretty hot,"
Over to our left and at about the same height, I saw a bright flash of light that slowly faded and finally vanished. "Probably a collision between two friendlies." I shuddered. "Another 14 airmen gone." I said nothing to the crew. Collisions between attacking aircraft accounted, we were told, for an increasing number of losses in Bomber Command. Aircraft were scheduled to arrive over the target in waves two minutes apart and at various heights. Even so, bombers were sometimes late in arriving or were at other than their allotted heights, maybe due to navigational or mechanical problems. Still there were plenty of aircraft in your wave and at your height to bother about. So your life and the lives of thirteen others depended on the vigilance and competence of all. Quite a responsibility for 20 year olds. I saw another explosion, this time on the ground, far below. Most likely a bomber, attacked by a fighter, crashed, bombs and all. I hoped the crew parachuted before the aircraft hit the ground. Fat chance!! We could see Wuppertal, ablaze, in front of us and still ten miles away. Dozens of searchlights speared skywards around the familiar box barrage of exploding anti-aircraft shells. Green and red target indicators confirmed the presence of our Pathfinder force. Heavy bombers were as thick as flies, thankfully all going in somewhat the same direction. Some above us, possibly early or late arrivals, were getting ready to drop their bombs on the target and on D-Donald as well. Others below us, silhouetted against the fires, were positioned to accept our load. The seemingly impregnable wall of fiery anti-aircraft bursts were closing fast. Probing searchlights seeking their prey, flashed by much too close. Only a few Luftwaffe fighters, though. Too dangerous over the target for them, I guessed. Most attacked the bombers before the target or afterwards on the trip home. Only the bravest and most dedicated member of a Nachtjagdeschwader (Night hunter squadron) faced his own flak (Anti-aircraft guns). Possibly we were too close to Dusseldorf. Or maybe it was just that "Jerry" was everywhere that night. Suddenly night was turned into day. We were coned by searchlights. The evasion procedure was:- nose down, throttles wide open, go like hell. The faster you go the harder you are to hit. Get out of the area as quickly as possible. I dived D-Donald and it flapped its wings, its motors screamed in agony and its fuselage shook violently. The navigator reported our air speed as "over 400mph." Heavy with bombs, we quickly dropped from 20,000ft to 15,000ft and were just about clear when I saw two bright yellow flashes, in quick succession, over the nose of the aircraft. I heard the "clump, clump" of two exploding flak shells. Then a noise like hail on a tin roof. I swore I smelled cordite. We had received multiple direct hits from a German anti-aircraft battery. "Bloody hell, the starboard inner engine's on fire, Skipper," yelled the engineer. I glanced to my right. Tongues of red hot flames were already straddling the wing and number two fuel tank. High octane petrol could explode at any moment. "Kill it fast, NOW!!" I ordered. The engineer immediately throttled the engine back and feathered its propeller. He quickly pressed the red fire extinguisher button for that engine. Thank Heaven the extinguisher did its job and the fire went out. The port inner engine had simply stopped. Two left out of four. "Feather it as well," I ordered. Hell, what next? Quickly I opened the bomb bay doors. There was an ominous glow coming from the area where the cans of incendiaries were hanging. "Jettison the bomb load FAST, I think the incendiaries have been hit and are alight." The bomb-aimer did not have to be told twice. I felt the Lancaster jump up as 11,000lbs of bombs fell away. There was no doubt we had jettisoned them just in time!! Suddenly we were free of the searchlights!! Maybe they could not hold us any longer. Perhaps they knew they had clobbered us and went looking for other game. "Anyone hit?" I checked the crew. All OK up front. None hurt. "Gunners OK?" God, no reply! Fearfully I sent the wireless operator back to check. They were all right. The intercom to the gun turrets were out. We were down to 12,500ft as we flew over the target. At this height we were as vulnerable as Wuppertal down below. We could have been hit by any one of thousands of bombs and incendiaries raining down on us from our own bomber force 7000ft above. "Skipper, the bomb bay doors are still open," the bomb-aimer reported. There was no way of closing them on this aircraft with both inner engines stopped. "And I can see the starboard undercarriage hanging half way down," the engineer said. "The port under-cart too," said the navigator looking over my shoulder. "We can't retract them without hydraulics," I said. Corkscrewing was 'out'. Even flying straight and level, we were losing height. The extra drag of the open bomb bay and the undercarriage was the problem. The two remaining engines were flat out. Boost +9lb/sq.in., 2850rpm. (1 hour limit). Desperately we tried other throttle and pitch settings but D-Donald continued to lose height. We jettisoned everything moveable, even some of our fuel. Later we released the carrier pigeon with a message. Maybe it would find its way back to England. I doubted it. The Lancaster could hold its height at 10,000ft on two engines according to the pilots notes. I had done this as an exercise plenty of times at the Conversion Unit. But not with bomb bay doors open and wheels half down. The crew reported extensive fuselage damage, mostly holes and rips in the aluminium skin. Possibly the wings were holed as well. Two simultaneous direct hits by anti-aircraft shells. Both inner engines knocked out, one on fire. Considerable damage to the fuselage and possibly the wing surfaces. The bombs had not exploded. It seemed that the incendiaries had burst into flames. We were still flying and under control, albeit loosing height. Nobody had been seriously hurt. With very little encouragement, the thin-skinned, 4000lb 'cookie' could have blown us to kingdom come and back, with the help of even the smallest piece of shrapnel. If we were attacked by a fighter, the gunners had no way of contacting me with evasion instructions. It seems we were a sitting duck for even the Red Baron in his Focker Triplane. "Unfeather the port inner engine. Maybe it'll rotate fast enough to generate hydraulic pressure and raise the bomb bay doors and under-cart." No joy!! We lost height even faster. "Feather the bloody thing again," I said. Straight and level, we flew around Cologne and at 0125hrs we crossed over the German/Belgian border. Ever losing height, we were now down to 3500ft. I could make out features on the ground below, through the darkness. Thankfully no fighters. They were, most likely, taking care of the main stream above and in front of us. Soon I would have to make a decision. Either I give the order to bail out straight away or hold on, hoping D-Donald would maintain height in the lower, heavier atmosphere. The trouble was we were approaching the point of no return. Soon we were going to be too low to take to our parachutes anyway. The other alternative was a forced landing at night. I quickly ruled this out as a quick way to oblivion for my six crewmen. Still we dropped and at 2500ft the engineer reported the temperature of the starboard outer engine was off the clock and it could seize at any moment.
" No oil pressure," he said. We were about 20 miles North-North-West of Liege, Belgium. The bomb-aimer jettisoned the escape hatch in the floor of his compartment, clipped on his chest parachute and without hesitation rolled out of the aircraft into the night. Next it was the engineers turn. With a brave smile and a nervous wink, he stepped down to the waiting hatchway, knelt on the edge and was gone. "The gunners have bailed out from the rear door, Skipper," the navigator reported. "They'll be OK."
The wireless operator followed the engineer out through the open hatch, leaving just the navigator and me aboard. "Good luck, Skipper," he said courageously as he handed me my parachute. "See you in Spain." He checked twice to make sure my parachute was clipped on securely, then with a reassuring glance, disappeared into the night. D-Donald and I were alone. Just for a moment the ship's captain syndrome almost overcame me. I felt sadness and shame because I was about to desert my mighty Lancaster. Soon D-Donald would be no more. It was no consolation that many had gone before me and there would be many more to follow. D-Donald and I were still loosing height. Hurry, hurry, we were down to 2000ft. I stood up to the right of the control column, keeping the aircraft straight and level with my left hand. Below the open hatchway waited. I hurried down and knelt at its edge. Then for a moment I thought of the hundreds, no thousands of aircrew who had attempted and were yet to attempt, to save their lives by abandoning their stricken aircraft, as I was about to do. For the vast majority, their desperate bid to stay alive would have been so different from my relatively orderly exit. The stark terror of a spinning aircraft with all those on board gripped by irresistible centrifugal forces preventing escape, flashed through my mind. Maybe their aircraft was on fire, adding to their desperation. If wounded comrades were left behind, what future nightmares would memories of a 'last glance into terror stricken eyes' generate for he who survived? What turmoil invaded the minds of those who knew they were trapped and could do no more than wait the inevitable? But I was lucky, all my brave crew were clear. All I had to do was roll forward and kindly D-Donald, still flying straight and level, would free me. The escape hatch on the Lancaster was 23in wide and 26in deep. As I squatted there ready to jump, I found it difficult to imagine how anyone could get through such a small hole. Resigned to losing the top of my head as I rolled out or worse getting stuck, I committed myself to fate and fell forward with my hand tightly gripping the rip cord. For the moment the slipstream seemed determined to push me back into the aircraft. Suddenly I fell free - free to plummet into a fearful black void. As I tumbled over in the air, I saw the dark outline of D-Donald above me as it flew on, alone. The slender fuselage, the broad rounded wings, the prominent four RR Merlin engines and the tailplane with its tall twin rudders, was a vision never to be forgotten. The trauma of the moment and that last glimpse of my Lancaster, are bound together in my memory forever. A bone-shattering jerk and my parachute was open. Shaken and confused, I found myself hanging, perilously supported by a flimsy canopy of white silk above me. Recovering somewhat, I wished the W.A.A.F. airwoman who packed my parachute so carefully, a long happy and prosperous life. Relieved to have made it so far, the fact that I was suspended on silken threads 1,500ft above the ground, was of little comfort. Just as well it was dark. I heard D-Donald’s motors getting louder and louder as it went into its death dive. It seemed that it was turning back towards me to extract revenge because I had left it to its fate. Then there was an horrific explosion and a blinding flash close by and down to my left. Vale D-Donald. Small arms ammunition began to explode, chattering like machine-gun fire. Although the bullets were not going anywhere, again I imagined that I was being fired upon in retribution. An occasional puff of wind swung me gently back and forth. I could only just make out the ground, 1000ft below me. Luckily I was drifting away from the inferno that used to be my Lancaster. I had heard terrible tales of parachutists landing in the fires of the cities they had just bombed, surviving only to face the wrath of the local populace. Others had come down in high winds and crashed into houses and fences. Many had been caught high in tree tops or buildings, hanging there, awaiting rescue by those who in anger, would just as rather leave them dangling, exhibited. I had also heard of an airman, after having been blown out of his aircraft without a parachute, crashing down through the branches of a tall tree and landing in a snowdrift at its base. Body badly broken - but alive. None of this was for me; it seemed I was one of the lucky ones and as I drifted down towards the open fields far below, I rejoiced in my deliverance, although with considerable trepidation. Suddenly and threateningly Belgium rushed up towards me. A parachute landing was equivalent to jumping off a 12ft wall but up high this rate of descent was not noticeable. Near the ground it was as if my parachute had collapsed. I hit hard and sprained both ankles. Maybe we should have been better trained as parachutists but I guess aircrew were supposed to fly aeroplanes, not jump out of them. I had plunged into a field near an amazed cow. She reared back in fright, wondering, no doubt, where the devil I had come from. * Uranus. Heaven in Greek mythology. * Cerberus. Many headed watchdog of Hades, the realm of the dead. An extract from "Flack and Barbed Wire." by Gordon Stooke.